with a little bit of Fancy! Receive 25% OFF Your ENTIRE PURCHASE! So Get it Girl and Get it Guilt Free!!! Unprecedented 50%OFF Your Entire Purchase!!! This SALE includes but is NOT limited to the Sale Page! And Take 25%OFF Your Purchase! We will be offering complimentary samples and selling glasses and bottles of our Chardonnay, Rosé, Cabernet Franc and Brut Rosé. I will be sharing my new spring collection, I'll have some fantastic promotions for you as well as some really great give-a-ways! Amy Jane will be offering complimentary hand treatments with ✨Natural Scrub Remedy✨ and will also have her entire product line available for sample & sale. 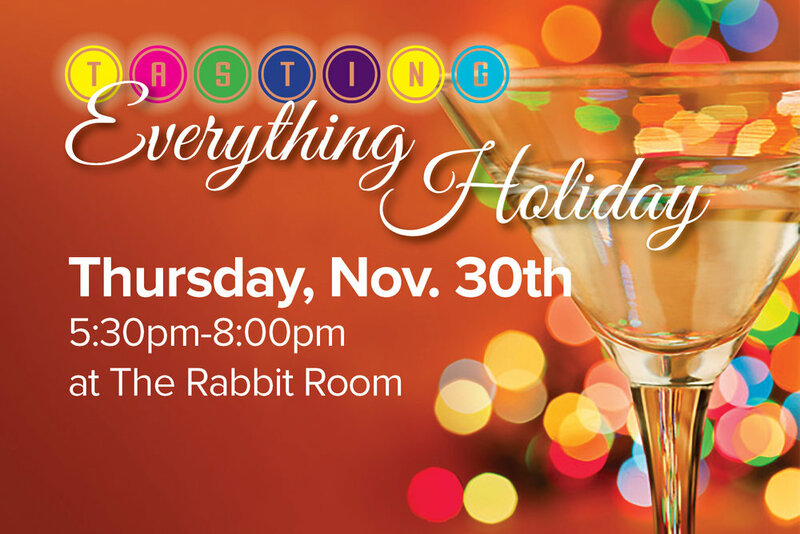 Come and See me at the charming holiday event in Pittsford, NY. Every December Pittsford celebrates its annual Candlelight Night. Pittsford's Village streets are filled with holiday cheer, the sounds of live music, carolers and sleigh bells. Holiday lights twinkle in the night as businesses light their candles to signify the start of the holiday season. It is the perfect night for shopping, dining at our local establishments, or the food trucks around the Village, or enjoying holiday treats provided by area businesses! Many merchants offer special sale items. There are also holiday craft activities around the Village and book sale at the Library. Visit the new Kid Zone at Northfield Commons. For more information, contact The Pittsford Chamber at 585-310-2004, or info@pittsfordchamber.org. ART JAM EVERY THURSDAY EVENING! Looking for a creative way to spend an evening Join Me For ART JAM! at The Rabbit Room...Stop and grab a beverage on your way up! What could be more fun than Sipping Mimosas with your Mom? Shopping while Sipping Mimosas with your Mom! AND Winning Raffle and Door Prizes!!! It's That Time Again Friends....And It Is No.7 In The Making! Shop my one-of-kind SPRING designs alongside the beautiful, hand selected clothing lines, American Made pottery, gifts and accessories that has made SJ’s a unique apparel and fine gift destination for over 25 years! 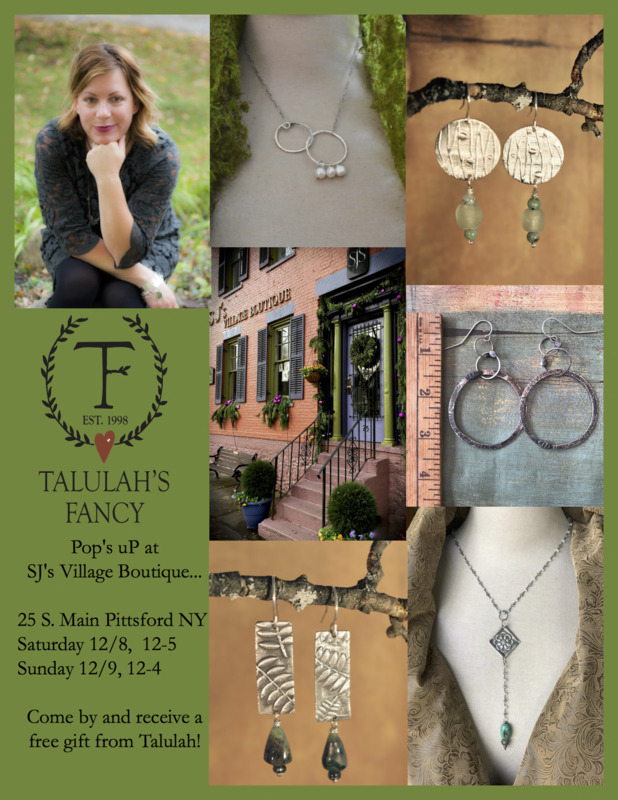 Join us Tuesday March 28th 4-8pm for A Talulah's Fancy Spring Trunk Show Event at SJ's Village Boutique in Pittsford, NY. Have you dreamed of running your own little gift shop? A location on the second floor of The Lower Mill in the quaint community of historic Honeoye Falls, NY could be your business destination. Contact me if you would like the opportunity to procure unique, one-of-kind gifts and creatively merchandise and sell them in a beautiful and inspiring atmosphere. Be your own boss, surround yourself with fine art, American made craft in an early 1800's post and beam flour mill...home of The Rabbit Room Restaurant and special event space. Endless possibilities await a self motivated and creative individual! Available January 31st. Shop my one-of-kind designs alongside the beautiful, hand selected clothing lines that have made SJ’s a unique apparel destination for over 25 years. You won't want to miss this Trunk Show during Pittsford Village's Candlelight Night. Don't just Imagine the magic and merry of this very special one night only event...come on out and experience it!